This picture was taken in January, when it was the same temperature but sunny here. WTF. Right after I pressed publish last Friday on the blog post about my Reba t-shirt, I realized that I was the worst person in the world. I had complained about getting up at 6:30 am and having one appointment. Poor me. Most people get up at the booty-crack of dawn and have to work the whole day long, with no time for ditzels, knick knacks, or futzing. For brief moment the length of the time it takes to write a blog post, I forgot that I was incredibly lucky to have the luxury of following my dreams, which I’m still defining at this point. I think it’s kind of a long-term smelting thing in order to figure out what I really want and if it’s good and what I should want and all of that. I’ve spent so much time trying to figure what I want to do that I haven’t been focusing on what I’m doing in the time I currently have. I’ve been scrutinizing the future so hard, trying to make sure I’m heading in the right direction and towards gainful employ/activities that I both enjoy and find meaningful, that I fell into the trap of believing that the only time that’s valuable is the time you’re paid for. Once I realized this, I paused for a second and thought “Well, do I enjoy what I’m currently doing?” which is making phone calls, setting up connections, exploring the city, interviewing, hanging out with friends, trying to get my feet on the ground, making networks that will take me into the future, etc. and I thought, yeah, I do. I have what feels like freedom and infinite possibilities. 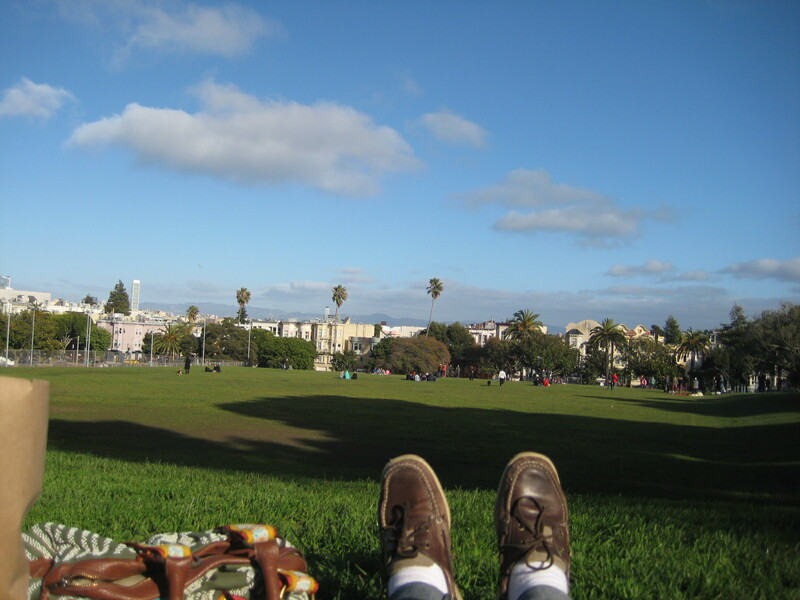 San Francisco is my shiny, expensive oyster that I plan on cracking in order to find the best dive bars and cheap eats. I am not my to-do list. The things I’m doing right now are also important, and these steps will lead me to a future, but in reality it’s all part of the same thing. So I should savor the whole enchilada because the minutes don’t come back to you in the end, or so I hear. And today I put a squirt of ketchup in my ramen noodles, which tasted just as good as I thought it would and I felt secure about my future as I slurped the broth down—it was thicker than usual. Ramen noodle innovation is just one of the many signs of nascent success. While you are in the process of tracking your dreams you are what they call living and by the way they have organic Ramen noodles now with the little packet also organic. They don’t cost that much more and your body likes them better. And San Francisco is the perfect place to get anything organic. I bet you could even get organic gasoline, or maybe it already is. I’m one of those people who’s always about 68-70% happy. Every job I’ve had, every living situation, I’ve basically been kind of happy, with an undercurrent of restlessness and discontentment. It’s my nature, I guess. Or the drugs….but probably your nature. I think I read something that said in the ideal job, you would enjoy about 70% of your work, so maybe you’re doing just fine. Love it! And I like that the title could also describe my day – and the days of many that I know – most days of the week lately… Here’s to ramen and all such trappings of youth and opportunity. Sounds like your mind is in the right place, and you’re headed in the right direction. I wish you the very best of success, and your own definition of happiness. I love how my process of dealing with the move is apparent to everyone on the interwebs. This is the blogger’s life—things are indeed looking up, though. The future seems exciting, at least right now, as does the present for that matter. I’ve been reading your blog for several months now – six, to be exact, which is approximately when I started exploring my own – and have yet to comment. I suppose today is no different than any other – notification of a new post dotted my inbox, and I eagerly pursued and quickly read its content. As usual, it was delightful, and I feel compelled to thank you. Despite the fact that we live in different countries (I’m up north in Vancouver, BC) and are at semi-different phases in our lives (I’m still doing the undergrad degree thing), I feel as connected to you as a person who has never met you, appears to have gone through an entirely different set of life experiences, and knows virtually nothing about you can hope to feel. And that’s pretty dang cool. Also (and please don’t take this the wrong way), I feel as if I am able to live semi-vicariously through your blog: mine is comprised almost entirely of ‘serious’ material, and despite a fervent passion for what I do there are definitely times when I wish I could throw in the occasional witticism or sarcastic remark. Thank you for posting the type of social commentary that often runs through my head but that I am unable to share freely with the world. Thanks for the lovely note—I’m glad to be providing something that you enjoy and am also glad that you have a blog of mostly serious material, which is something I often think about but don’t think I could actually do well or continually. May we continue to blog into the future and hold down our respective sides of the fort! I’ll try not to…no more worrying about the future and forgetting about the present. you’re gonna do fine, kid! and your future will be better for your realizations now. good on you! Nice nice nice! I did something similar a few years back that’s paid dividends today. Just to be clear, I’m talking about the living in the moment experience, not the Ramen noodles experiment. Haha I love it. You should try the Ramen noodles experiment one day, but I’m not forcing you. I think this will pay dividends so now I think I just need to keep on investing. I think I love it too…the search stuff, that is.